The foundation consists of donated beer crates loaded with sandbags. 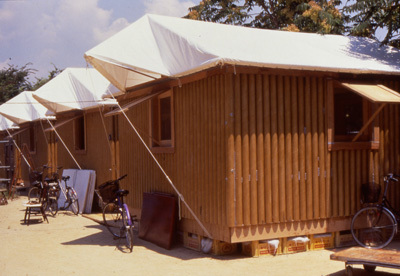 The walls are made from 106mm diameter, 4mm thick paper tubes, with tenting material for the roof. 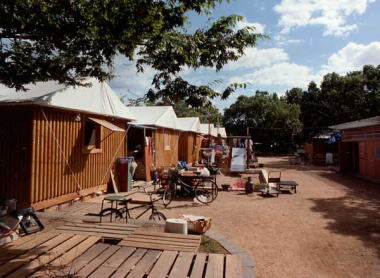 The 1.8m space between houses was used as a common area. For insulation, a waterproof sponge tape backed with adhesive is sandwiched between the paper tubes of the walls. The cost of materials for one 52 square meter unit is below $2000. The unit are easy to dismantle, and the materials easily disposed or recycled.